I am bidding an adieu to November and giving a warm welcome to cold Decembers which I am eagerly looking forward to. While the Western countries have almost set foot into holiday season with Halloween, Thanksgiving and now Christmas to look forward to, my blog hopping takes me across to sites with numerous recipes posted marking the holiday season. Foodbuzz, Tastespotting and Foodgawk have been bubbling with tempting pictures of food ranging from pies, cookies, cakes, roasts, et al., all for the holiday season. With Diwali going by the last month, I pulled down the lights and diyas only to put it aside for some time. On the back of my mind, I knew Christmas will be here soon and these would be put to use again. I have been scuffling through my cabinets to pull out the decorative baubles and tinkles which have not only left me fascinated over years, but also draw my daughter's attention these days. The vivid colors from wreaths and ornaments have caught her undue attention and the tinkling sound from bells seem to keep her engaged endlessly. Christmas has caught up with her and the lights fascinate her beyond anything. We'll soon put up the Christmas tree, light it and decorate our home. I don't think I even need a reason for celebration! I decided upon the quintessential baking of fruit cake this year too, which may sound usual since I do it every year during Christmas. It's neither tradition nor a norm I follow, it just makes me feel good. For a long time now, I pushed burning my oven to Christmas, since baking needs precision in measurement of ingredients and with a baby on my arm most of the time, I can hardly imagine doing that. The weather I guess has been a good motivator for these biscuits. And though the sun comes out occasionally beneath the silver lined clouds to warm up overcast skies, yet there's an exhilarating nip in the air which has been my real boost for these Cheddar Black Pepper Biscuits. Preheat the oven to 450°F and grease the pan with a teaspoon of the melted butter. Combine the flour, baking powder and salt in a bowl. Cut chilled butter to small cubes and add it into the dry ingredients. Rub using your fingertips until resembles bread crumbs. Add the buttermilk and mix briefly, just to incorporate it. Try to work gently, do not overwork the dough else the biscuits will not be delicate and light. Gently mix in the cheddar and black pepper. The dough will be fairly sticky. Place the dough on a smooth, well-floured surface and pat with your hands to about 3/4 inch thick. At this stage you can either wrap them and place it in freezer or continue to bake. 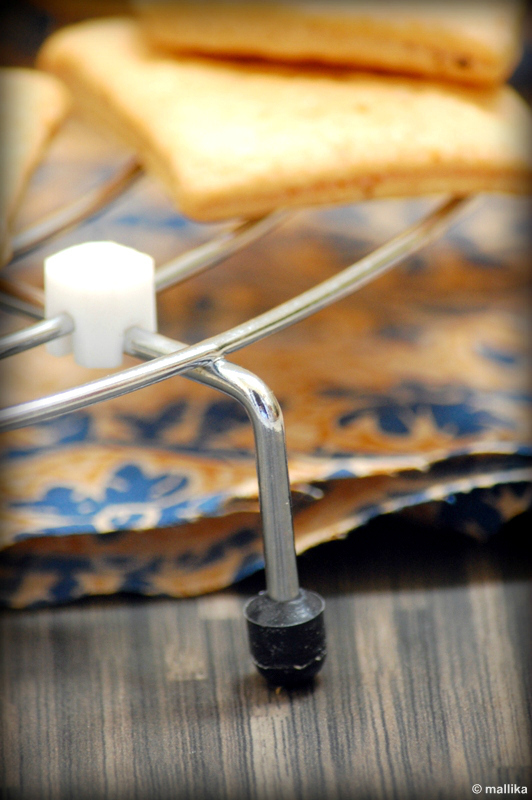 Roll and cut out the biscuits, using a cookie cutter. Dip the cutter into flour between cuts to keep from sticking. Place the biscuits on the prepared pan. Prick them with fork. The remaining dough may be gently gathered together and rolled out again for more biscuits. Brush the tops lightly with melted butter. 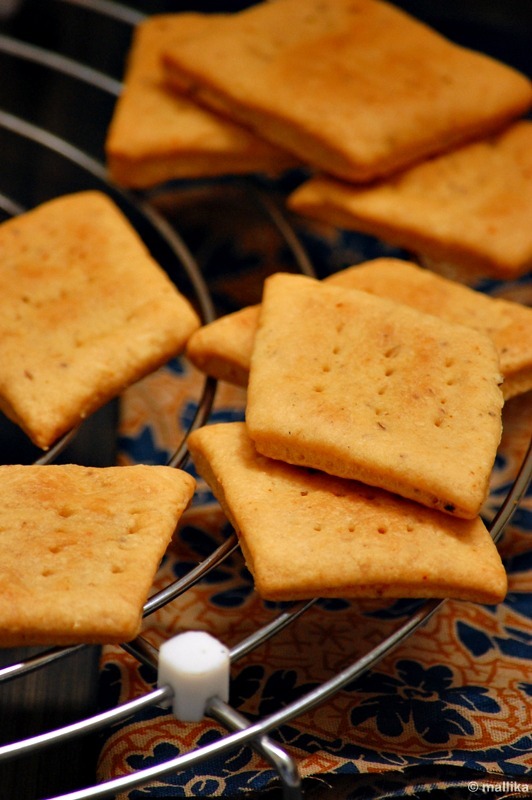 Place the biscuits in the oven and bake for about 10 minutes or until the tops are golden brown. Remove from the oven and allow them to cool a little. Lift them from the baking tray and serve warm. The dough is fairly sticky, hence refrigerating it helps in better handling of the dough. 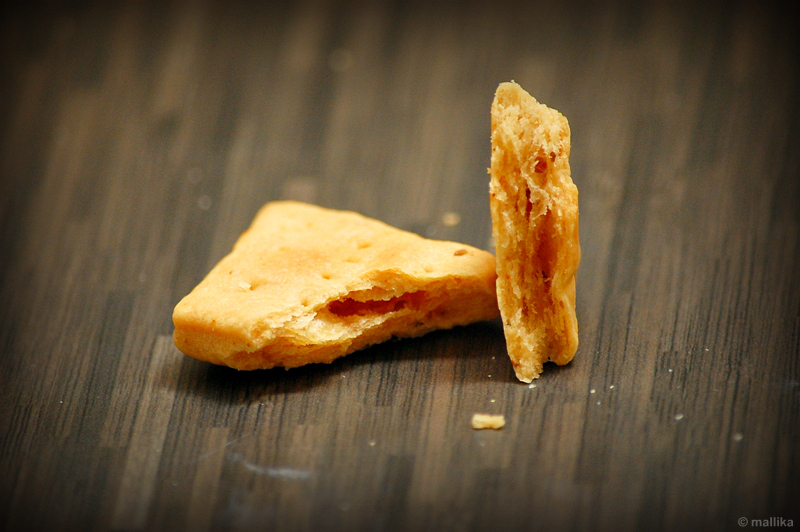 Roll them thinner than I did and they will end in crisp, nibbling biscuits. Roll them thicker and they will make scones. Serve them with some sliced tomatoes and cheese and they make raving starters for any party. I love my biscuits warm and spicy. 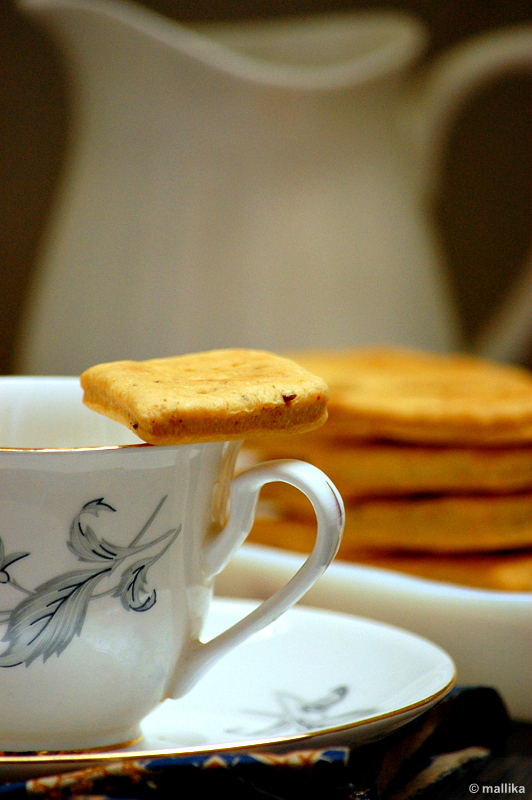 Adding a dash of chilli flakes pepped up the biscuits and added warm notes to it. 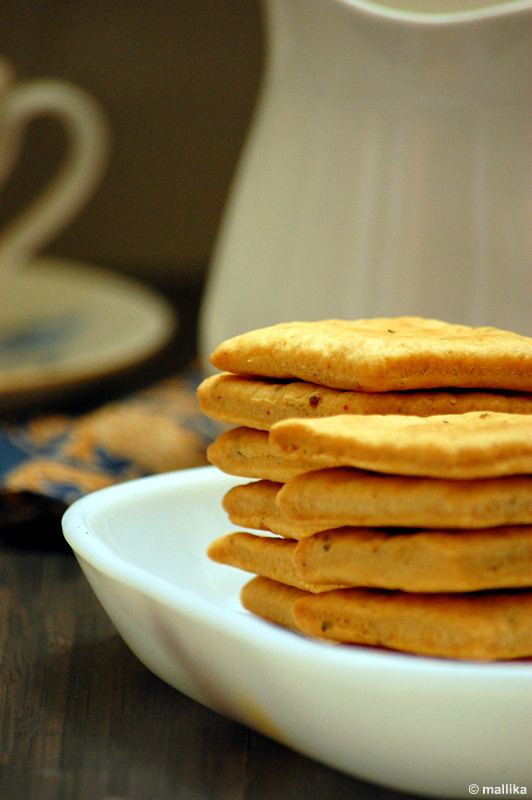 We paired them with a warm cup of tea and these spiced flaky biscuits made a great companion for a relaxed chill, rainy evening. I'm admiring your last pic of these beautiful savory biscuits. They are so light and crispy! These crisp treats look perfectly made! Tempted! I have to try these.. Absolutely gorgeous.. 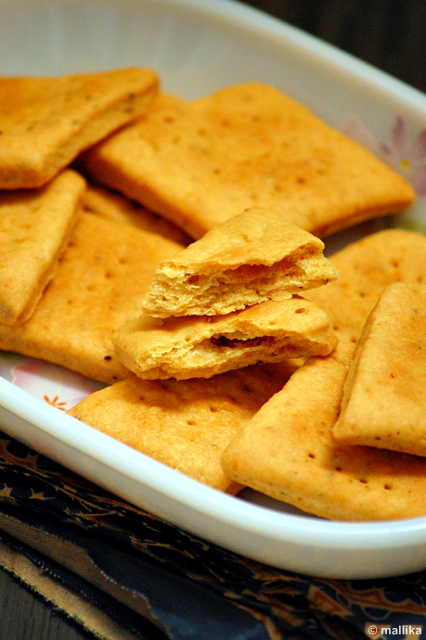 I just cant take my eyes off these fab clicks of these super tempting biscuits!! I just have to give it a try real soon!! !And your recipes I have tried so far have always been a success & a big hit with all! Seriously feel like munching some..beautiful biscuits..
Gorgeous biscuits! Looks so delicious. These look so mourish! 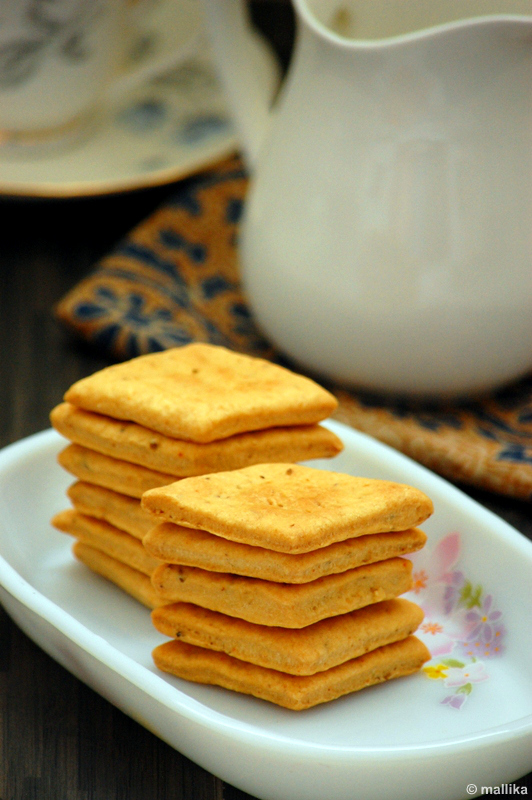 I have always wanted to have savoury biscuits ready to go when guests come over. How long do they keep for.? Not that they would stay uneaten for long! interesting flavor ...they look delish !